The 10th annual conference of the Ethiopian Public Health Laboratory Association (EPHLA) was convened on 23 February 2018 at the Global Hotel in Addis Ababa, Ethiopia. 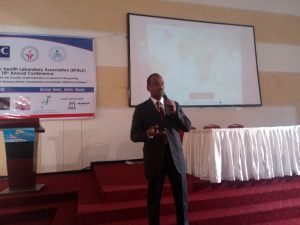 The meeting was attended by African Society for Laboratory Medicine (ASLM) Program Managers Drs Amha Kebede, Wubshet Mamo, and Aytenew Ashenafi, and Dr Ali Elbireer, Chief Executive Officer of ASLM, was invited as the keynote speaker. Dr Elbireer began his keynote address by displaying the strategic goals and objectives of ASLM to the conference participants. ‘Public health laboratory associations should work towards integrating laboratory professionals towards common goals and speak to the same purpose,’ said Dr Elbireer in explaining the ASLM 2020 strategic goals. Dr Elbireer spoke about the efforts of the African Accreditation Cooperation and ASLM to support more African laboratories in achieving accreditation to International Standards Organization standards. He mentioned the decentralized SLIPTA 2.0 programme, which shifts the focus to increasing in-country capacity in order to cover all of a country’s laboratories. He next addressed the importance of mapping laboratory capacity, systems and networks in Africa. ‘It is critical to establish standard, objective data of sufficient detail on testing needs and laboratory system and network gaps,’ he said. Such data can then be used to inform systems strengthening priorities, target product profiles that would be useful to governments, policy-makers, resource allocation decision-makers, implementers, diagnostic device developers, and donors investing in improved access to healthcare in Africa. Finally, Dr Elbireer pointed out ASLM’s open-access scholarly journal, the African Journal of Laboratory Medicine (AJLM), and that AJLM is included in the PubMed Central (PMC) database, which is indexed in PubMed. He also mentioned ASLM’s Lab Culture magazine and invited participants to visit ASLM’s website (www.aslm.org) for more information. Ndlovu, Nqobile. SLIPTA 2.0 – the next “country driven” frontier for laboratory quality improvement. Lab Culture, Issue 18 (February 2018).